Interior of the restaurant – The stools made long meals not as pleasant. But the bistro/cafe/bar-like ambience suits a casual dining eatery to a tee. 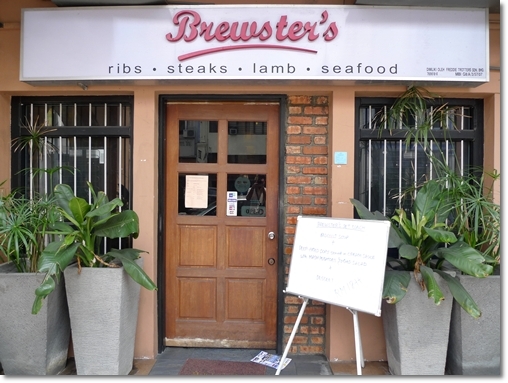 Brewster’s Restaurant in old town of Ipoh might have not piqued many people’s interest for the location was not as strategic, nor in the midst of a trading hub. Hence news has it that they’re relocating soon to a new premise in Greentown, tentatively opening in September of 2010. Previous experiences at Brewster’s proved to be mediocre; or maybe it was because I usually went for the lunch sets (RM18/USD5.50++ exclusive of drinks). But they do take pride in their pizzas, spare ribs, crispy pork knuckle, pasta and such. 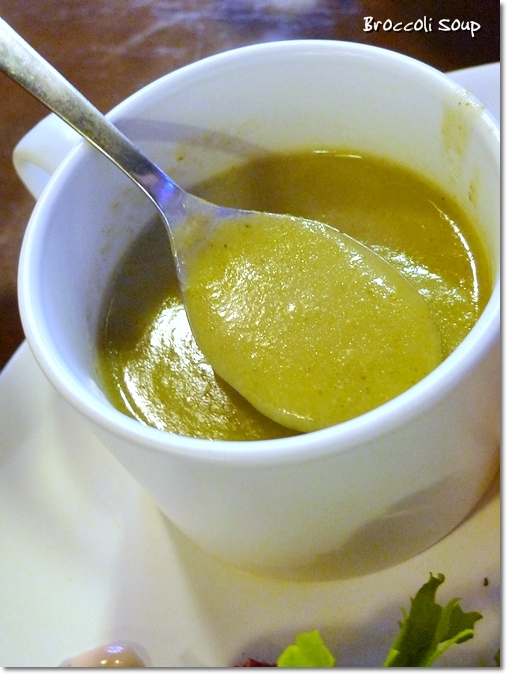 Read on to find out more …..
Creamy Broccoli Soup included in the Lunch Set. 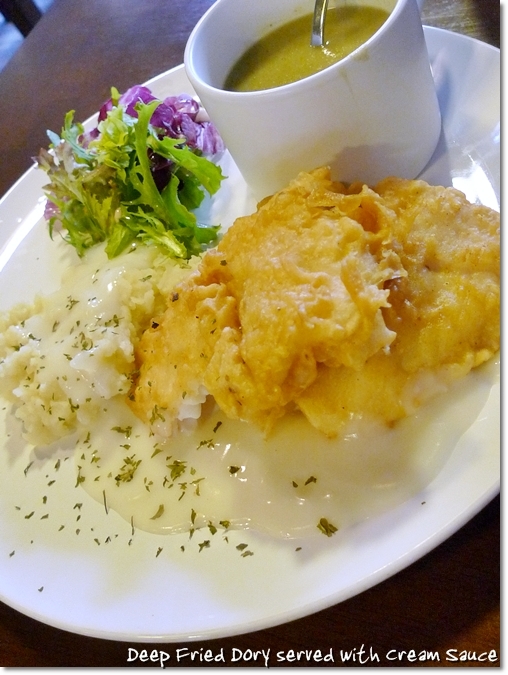 The deep-fried fillet of dory with cream sauce which was almost too bland/tasteless to register on our palate. The fish was good, being fresh and succulent but the starchy cream sauce did not go down well ….. 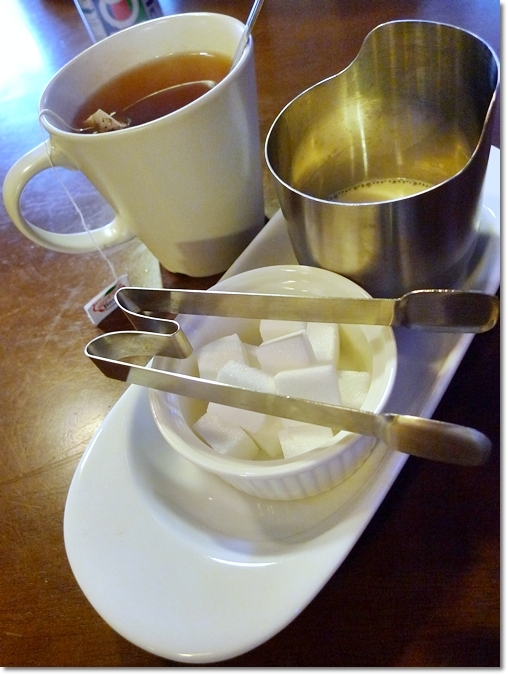 Seldom do we see cubes of sugar used in the other cafes any longer. A nice touch, albeit this tea DID NOT come with the set. 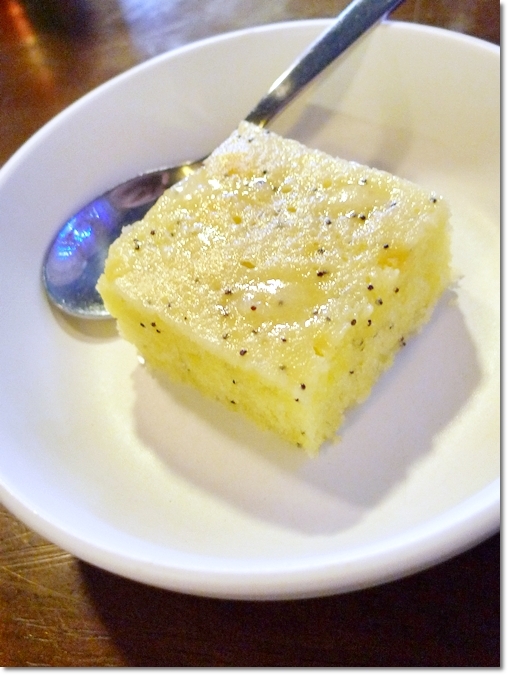 Dessert of the day was a sweet block of vanilla-flavoured cake, with poppy seeds. I was not sure what it was exactly, but a cross between condensed milk, caramel, and a syrupy sweetness. Forgot to blog bout this one, hmm. One find day, we ran out of idea on where to dine. Then colleague rmbr i mentioned bout Brewster’s before. 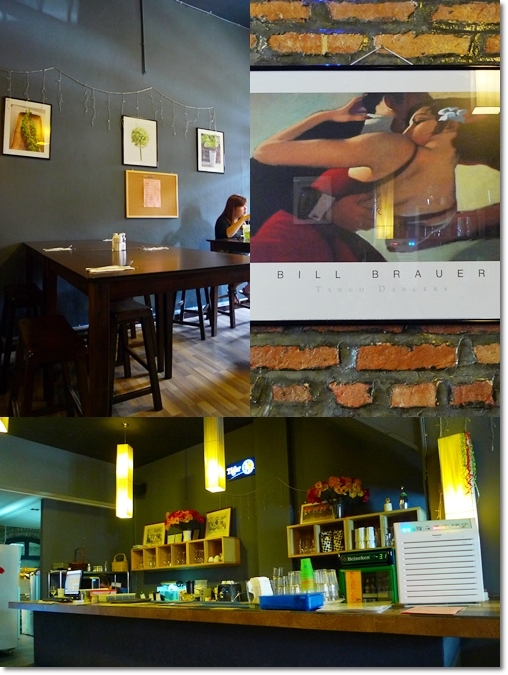 It is located on the beginning of Jalan Sultan Idris Shah (Brewster Road), near Padang Ipoh, right at the curvy corner opposite FMS Bar & restaurant. Quite hidden, mind you. And parking’s a mess. But it’s just a short walk from our office, muahaha … Anyway, the set lunch that day was Deep Fried Dory etc etc … (too long la the name of the dish). RM18++. Well, won’t burn a hole, so we stepped in. Menu was simply, TOO simple in fact, printed on color papers, with no photos whatever. Prices ranging from RM20+ for mains, and RM4 to RM8 for drinks. Oh, set lunch DOES NOT include drinks, though plain water is free. Ordered Brewster’s Special Ice Cream Coffee RM8.50. Frenz ordered Ice Lemon Tea RM6, and Coke RM4. Tastewise? Fish was moist, not too dry, though typical dory smell existed. Wonder they use Pacific Dory? 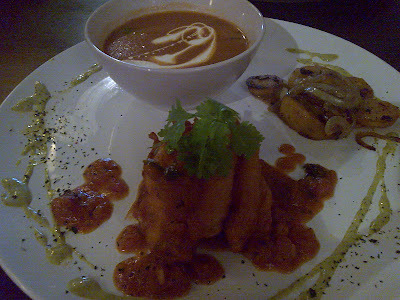 Or the cheaper Cream Dory variety.Hmm … Cream of Tomato soup was tasty, enough zing, and not too creamy. Best part was, the sauteed potataoes. WOW, so so delicious! with caramelized onions and mushrooms (button version), this side dish got the thumbs up. But too small a portion la …haha… Oh, they serve the fish with greenish sauce around the plate, tasted slightly sweet and spicy. Probably honey mustard, but I’m not sure. The coffee with ice cream was normal, nothing special. Just your typical vanilla ice cream in milk coffee. Dessert served was Chocolate Brownie, topped with Sugar Dusting. Small portion, but moist and chocolatey enough. 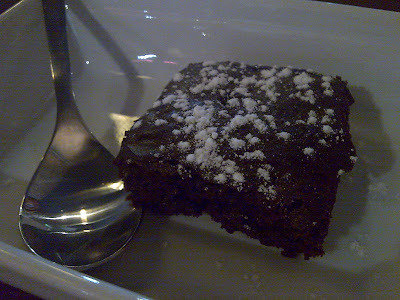 It was warmed before served, the way brownie should be served. Nice. Total for 4 pax = RM99.00. Not bad, but slightly small portions. Hopefully the ala carte dishes will fare better …. Til the next time …. Em… perhaps it’s similar like fine dining? hmmm… the food here looks interesting enough that I think I’ll pop over tomorrow for lunch and try their a-la-carte menu, mom’s expense account of course. I’ve heard some ok reviews about this place. I’ll be sure to post a review of this once I get a chance altho I’m pretty backlogged from the past couple of days. yup went there today and they still do the set lunch for RM 18 and the place is doing pretty well in terms of business. And yes I hv been dining out a lot since I’m bk in Malaysia for holiday. I will update my blog tomorrow once I get some spare time. yeah, RM18 for a set seems a bit steep for set lunch in Ipoh though. but still, many throngs over for a quick bite. I used to work at brewsters..
Well,have u tried the pork knuckle? You should really go and taste the pizza now.. Cause they have pizza already..
lol..wat u ate was SET LUNCH? u shud have try ala carte wei..
hey Anonymous. I’m thinking of going for another visit, maybe dinner, as lunch hour may be a bit rush, to fully enjoy a meal. so the pork knuckle’s da bomb? you USED to work there? hehe … now not attached anymore? We had Brewsters tonight and it was ok but more like fusion than anything else. First he claims his Caesar Salad is based on the original by Caesar Cardini, but it is not, he adds Bell Peppers (capsicums) and mushrooms, which any decent Italian Restaurant would not do, at least not in most places. The salad is “suppose” to be simple, elegant in its own flavors and not complimented by additional items. His Carbonara while not bad (it is good in its’ own right) is “not” true Carbonara by any real measure, I am not trying to sound cocky here, but this is one of my favorite dishes that I will order at just about any place that offers it and I have been eating it for the better part of more than 20 years. Carbonara should have a slight flavor of cream (actually authentic Carbonara does not use cream at all but eggs instead and oil) and a strong flavor of parmesan cheese and bacon. His has a very strong cream taste and virtually no parmesan flavor and when we asked for a tiny bit more they said they would charge RM5 for a little additional parmesan. I have never been to any restaurant that charges for parmesan cheese, and even though this is Malaysia that is ridicules, at the very least you do not try to profit from an additional adding, you would charge for cost. I order Parmesan for our home here and I get it in 20 Kilo Wheels and that costs me only RM 180, so I am not sure how a couple of grams (actually less) of parmesan would cost around RM5. Lastly there pizza uses Caputo 00 flour which is good, this is an authentic flour used in Italian Pizza Tratoria’s however, he is using an electric oven according to two of his staff, while that is fine (although not authentic) he is definitely not cooking it at around 380-398C. This is the recommended heat for a real pizza place (most home ovens cannot reach that temperature) therefore his pizzas are not that crispy, in fact they are not well browned on the bottom of the dough and while it is tasty it does lack in firmness and crispiness. A quick search on the internet for pizza dough’s (restaurant) you will see what I mean, or you can go to aboutpizza.com or better yet you can go to http://pmq.com/ to see how it should be, they are the industry leader. His food is good and tasty, but again I would say it is more fusion than anything else, and he lists a pork burger as a hamburger, this reminds me all to well of the other day when I was in a restur5ant and I ordered a hamburger and the staff said they do not have hamburgers only chicken burgers and beef burgers. A hamburger is an American invention and has “always” denoted a “BEEF” burger, it was named hamburger after the city of Hamburg, Germany where the original “patty” was constructed, but putting it on bread and calling it a hamburger was an American invention and means beef burger, if you use pork it is a “pork burger” and it should not be called a hamburger. Lastly they have this RM18 sitting charge they reserve the right to impose if you do not order anything, now not too many places do this anymore in this day and age, there are many reasons for why a person is not going to order, they may be sick or already ate, so if a couple comes to your place and only one orders, why to charge the other? Please do not say because they are taking up a seat, this does not pan out, because if the one who is ordering went there by themselves, you are not going to sit another stranger at that persons table anyway. It is better to allow them to enjoy themselves. Again the food was nice on its’ own merits, but I would not call it what it is called above and say that it is authentic or being true to the original ideas. The pizza does need work though. hey there, Anonymous. It’ll be better if you used a nick of sorts, as I’m not sure if you’re the same Anonymous from the previous comments. anyway, that was a VERY comprehensive review of the place, and I really really appreciate that. I’m only exposed to Italian food cooked the ‘Malaysian’ way, and thus may not be able to differentiate the dough used for the pizza, nor the basics of Italian cooking. now, IF only the proprietors of Brewster’s read this feedback of yours. I was the one who posted the above comment as Anonymous, I use RMO for now on. His place is not bad by any means, the food is tasty and nice, I just would not call it what he does or at least say it is authentic. I do understand cooks will take liberty with their food and there really is nothing wrong with that at all. However, I do believe you should let the customer know though and not give a description on your menu to allude that it is based off of the original or authentic dishes. I also do not believe in charging people for tiny amounts of extra ingredients. Although I am sure (actually i have heard)some places will do that (McDonald’s in Russia charges 50 cents for extra packs of ketchup), I do not think it is correct. You want your customers to be pleased and happy and not offend them by charging for every single item. At his prices he should be making a profit (I fully support anyone charing anything they want to for anything) I just think it is poor customer relation management. There is an old saying that “the customer is always correct”. In any case, his food is nice, a bit pricey especially for Ipoh, but tasty. His Caesar I would call it Garden Caesar Salad since that really is more of what it is. But do go and try it yourself. Yes “real” Italian food in Ipoh i snot easy to come by same to with real Mexican or American food. no prize for guessing what’s Ipoh’s forte is. anyway, RMO, appreciate your comments, and do drop by again. Actually the ingredients are very easy to get in Ipoh, especially if you are a business as there are many distributer that bring them in and the price if very very affordable. Secondly, I understand about catering to local tastes (however i do not think he is trying to do that) as so many places do that here, which would actually make it a much lower grade, not because of local tastes, but because those that do, usually end up using the cheapest items. There are several Western Places here that do offer items in their authentic manner, my complaint was that in his menu he states these are authentic when they are not. Therefore those who eat them, may think this is how they should be and it really is not. As for David’s Diner, I would not say they are the only American place here. First while I know them and they are doing a very good job at trying to be as close to American as they can be on their budget and it is ran by an American, it is close to American but not all “true” American. For instance what they serve as sausage with the breakfast is nothing like America, we do not use Hot Dogs ever for sausage, we use well Breakfast Sausage like you get at McDonald’s, usually made out of pork, but beef can work also. But she does have the very best in cookies for certain and he Mexican (TexMex) is very good for here. However, there will be a new American place opening up in Ipoh later this year in a few months. I;’ll give you their name later once I know the name, but I had heard there is a real (actually suppose to be all authentic ingredients) American place opening up later. is it a new pizza place in Ipoh? i’ve heard bout it as well. hope there’ll be more different type of cuisines in Ipoh, instead of the average kopitiam, HK cafes, and chinese restaurants. Yeah I heard somewhere that it is going to be a real American pizza or Italian place, not a chain though or a franchise, privatively owned. As for me, well I was born and raised in the US and am a citizen of the US but have lived in Malaysia for many years, too many to mention (before the turn of the century.) So I am experienced enough on local foods, international foods and internationals placed owned by internationals. I have also lived in a few other countries as well. So, yes I do love food and I think I am more a traditionalist in that I personally do not care for fusion or even large interpretations of well known classics, I like them to be based on original concepts with a touch of individuality. It is that touch of individuality that can make a dish shine out on it’s own or just run of the mill. I have been to Brewster not more than ten times since its opening. Like or not I will only go there if only I were invited as a guest. Out of my own pocket, Thanks & no thanks. Simply because they charge for a glass of H2O. U do not even know if there are from the tap. Also is understandable if it is a coffee shop. No wonder every time I passed by is usually empty. I am sure a lot of people share my view on this. Is not that we cannot afford to pay 50cents or even a $1 for a glass of water. Is just a bloody rip-off. After spending over 100 bucks you still have to pay for a glass of H2O!!!! Even Indulgence so well known for its price does not charge for a glass of H2O.